I've been a baby photographer in Athens GA for 14 years now and I think of of the most amazing things about photographing babies is their love for the world. Yes, you might get a rough day where baby is overtired or overstimulated, but most of the time a baby is thrilled with me and I get amazing pictures. Taking pictures with babies of all ages is a lot of work though. It's not just plopping a baby down in a basket or on a rock and stepping back to snap pics. Setting up a safe location without competing with the surroundings for attention while still getting good lighting is important. Athens is a great town for baby photography though because there are so many unique locations. We could go to the UGA botanical garden for flowers, we could go to downtown Athens or Watkinsville for urban babies, we could see the UGA Founder's garden with all of it's perfect lawn, even the client's own backyard or home is wonderful. You have to know what's developmentally appropriate for the age of the baby and how to photograph it well. Expecting a 4 month old baby to be sitting up or a six month old baby to be walking is just not going to happen. Minimizing distractions and overstimulating is crucial. Baby's favorite toy is helpful, a grandmother screaming at the baby to "LOOK HERE!!!" isn't because then the poor baby has no idea where to look and gets confused, overwhelmed, and melts down. Above all the key to photographing babies is to know when to keep pushing or to stop taking pictures. Each baby is different, but you know you have it right when you say "She's done." and the mom goes "Yep." 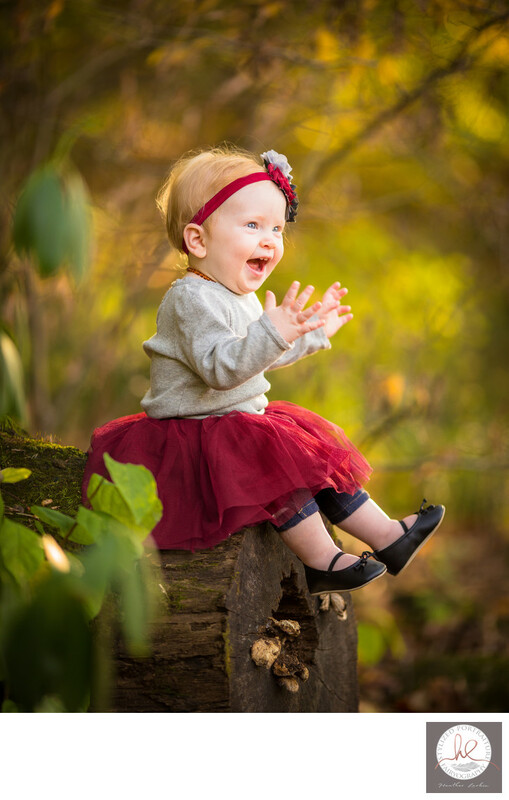 This cute cute baby girl was a little over one year old when I did her pictures in the fall. We chose a spot in the UGA Botanical Gardens for her portraits, because the autumn leaves would highlight that burgundy outfit and look great on the family's holiday cards She's sitting on a log so I could get a nice blurry bokeh in the background to separate her from the leaves as well as from the foreground. The tiny baby shoes just make her seem all the more small and adorable. Keywords: Botanical Garden (117). 1/400; f/2.0; ISO 500; 135.0 mm.